Serve with fluffy pancakes, granola and yogurt, or creamy vanilla cheesecake. 1. Preheat the oven to 200°C, gas mark 6. Using a serrated knife, slice both the peeled and unpeeled clementines into 1cm wheels. 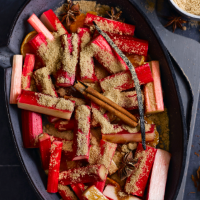 Mix with the rhubarb, vanilla and spices in a large ceramic baking dish. Sprinkle over the sugar, then cover with foil, scrunching it tightly around the dish. 2. Bake for 15 minutes, then uncover and baste with the maple syrup. Return to the oven, uncovered, for another 10 minutes, or until the rhubarb is tender and sitting in a puddle of juice. (The cooking time will depend a little on the thickness of the rhubarb.) Cool to room temperature before serving, until the syrup has thickened a little and the rhubarb holds its shape.